Rich amber color. Honey, toasted almond, prune, caramel, and tobacco aromas are inviting. A supple, silky entry leads to a fruity medium-to-full body of candied papaya and mango, chocolate toffee, and baking spices. Finishes with a tangy and graceful chocolate covered peach and cigar box fade. Soft and sensual. The massive, wonderful bouquet contains scents of ripe grapes, fruit-topped cheesecake, prunes, dates, figs, coffee beans and chocolate-covered cherried. The palat entry is long, sweet, cocoa and rich. At mid palate there are subtle bittersweet hints of citrus, black coffee, and caramel. Finish is huge, sweet, and concentrated. Aged for over a year in American oak casks which have been previously wined with Sherry, ensuring that the colour, aroma and flavour possess all the characteristics associated with a fine Brandy de Jerez. Rich intense bouquet, warm with hints of cinnamon and vanilla. 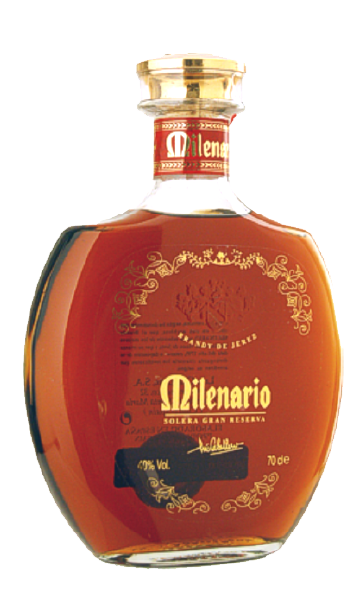 Made using the traditional soleras & criaderas (nursery) system which is fully controlled and certificated by the Brandy de Jerez Control Board. Distilled wine spirits are aged for over three years in American oak casks which have been previously wined with Sherry, ensuring that the colour, aroma and flavour possess all the characteristics associated with a fine Brandy de Jerez Gran Reserva.